Michelle and Dragonxser......congratulations, pls contact me so i can mail you your kits. The March blog giveaway is for another shetland mitten kit. I had some Hunter green left over and thought this would be perfect for my new mitt pattern.......we are all sick of winter and some lovely green is just what we need....hang in there its almost spring ! I have a few shades of green. You could choose: Evergreen, key lime, Blue spruce(not shown) the colours are true and as the name suggests or Hunter green shown above ! Or scroll down to choose another Glorious colour listed. This is the new mitt pattern. Cabled Cluster stitched cuff and smooth palms.....easy to knit! In the kit you get the pattern and a 100 gram skein of your colour choice. decided to add the pattern to this post, you'll find it at the end of this post ! You will need 4mm- US size 6 and 3.75mm- US size 5 needles. 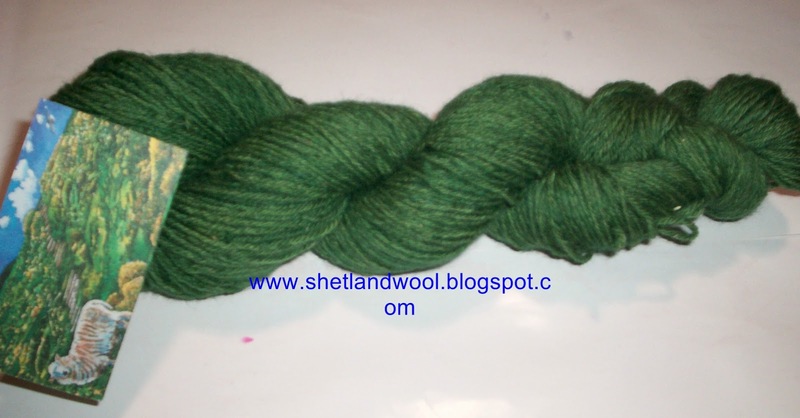 The yarn is 80% Shetland wool and 20% Angora rabbit in a lovely 4ply with about 440 yards. This yarn is a sock weight and knit with 2 strands together makes for a lovely thick heavy mitten that is so much softer due to the angora content. The yarn is what we have spun but the raw fibre was purchased on the net....its not the softest but its nice enough for warm quality mittens that will last and last ! I just got around to shearing my lot, well my husband Gilbert sheared them for me, i supervised as all good wives do....LOL ! 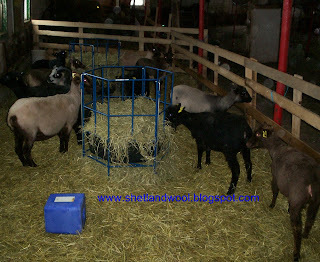 the sheep feeders shown in lovely royal blue are from www.sydell.com shipped to me from Burbank SD. US of A. I love their equipment though its a bit pricey with the Canada import added on ! Similar sheep furniture is available in Canada from www.wool.ca they have a catalogue full of farm goodies....their lambing pens are very reasonaby priced and the quality is good. He was very Shocked by the softness of the fibre......for weeks he's been laughing at me for buying Shetland sheep when i have all that raw muskox fibre to play with (he's such a fibre snob), not anymore. He now thinks the fibre is lovely and will mahe beautiful yarns. I just want to get the yarns spun and knit lovely things such as socks for him ! I'm looking forward to writing some new patterns for the yarn. Finally got around to starting the shawl and i'm writing the pattern as i go along. A few of my older ewe's are in-lamb and should be having lovely little lambs this April or May ....more soft fleece yippie ! To Enter this month's giveaway simply tell us what colour yarns you would like in your kit. RUNS FROM: 2nd March 2013 TO 31st March 2013. 11: Azalea.......Best of Luck ! The Cluster mitts require 80 grams of yarn, about 350 yards. 1 pr of 4.00mm straight needles. TENSION: 24sts = 4'' X 36 rows 4'' to get this tension you may need to use a different size needle. these mittens are quite heavy and most suitable for winter time. To begin: with 4.00mm's and 2 strands of yarn held together cast on 48sts. Rep the 8 pattern rows below 3 times. Row 1: (RS) p2, *k2, p2; rep from * to end. Row 2: and every alternate row: k2, *p2, k2; rep from * to end. Row 3: p2, *cluster 6, p2; rep from * to end. Row 5: As 1st row. Row7: p2, k2, p2, *cluster 6, p2: rep from * to last 4sts, k2, p2. Row 8: As 2nd row. After 3 pattern repeats move sts to D.P.N's, join to work in the rnd, pm and on next rnd decrease 6 sts evenly. You now have 42sts divided onto 3 needles- 14-14-14. Knit another 4 rnds then beg Thumb Gusset as follows. rnd 1: k18sts, pm, m1,k1,m1,k1,pm, k back to beg. rnd 2: and all alternate rnds knit without shaping. rnd 3: k18, sm, m1, k3, m1, sm, k to beg. rnd 5: k18, sm, m1, k5, m1, sm, k to beg. rnd 7: k18, sm, m1, k7, m1, sm, k to beg. rnd 9: k18, sm, m1, k9, m1, sm, k to beg. rnd 10: k18, sm and put sts onto holder, i use a legth of yarn as it lays flat and keeps out of the way....i hate Rigid stitch holders ! cluster 6= k2, p2, k2 from left-hand needle, slip these 6 sts onto a cable needle. Wrap yarn twice anticlockwise around these 6 sts. 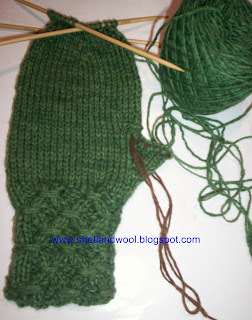 slip sts back onto right hand needle and continue across row. (RS)= right side. K2= knit next 2 sts. P2= purl next 2 sts. pm=place marker. sm=slip marker. m1=k into front and back of next st to make an inc of 1 st. rnds= knitting rounds. Bordeaux is my choice. I love making mittens and socks. Good luck to everyone . I would love to make mittens out of the Raspberry. Thanks for the chance. Am I the Michelle who won, or is there another? SQUEE! I'll have to look at the colors again; so hard to choose!!! I'd love the Evergreen, Lime and Spruce (is the one in your stash in Ravelry?) Is a truly beautiful color way. Bordeaux please. Thanks for the giveaway. I'd choose the Turkey Red. Thanks for the opportunity! I think Blue Spruce would be lovely! thanks! Love those greens and look forward to seeing you at the Frolic! Hello, you won, your entry number was drawn at randon. please contact me with your details ! Oh, blue spruce would be gorgeous! Blue Spruce sounds lovely. Thanks! Slate blue would be fabulous! Thanks for hosting another wonderful giveaway! Hi, i see you contacted me with your address. I will mail out your yarn kit on Monday from February. Lucky you contacted us later rather than sooner because now we are using yarns spun from our own shetlands.....its so much softer and more beautiful than the raw shetland fibre we bought in from a Breeder/farm in new brunswick ! For your March give away I choose navy blue. Hello Matt M.....you are our 2nd winner....pls contact me with your details !